What Are The Health Benefits Of Staying Well-Hydrated? Staying hydrated is one of the best things you could do to stay healthy and maintain a healthy body weight. Staying hydrated is one of the best things you could do for your body. The human body is made up of 50-75% water. Our body relies on water as the medium to conduct many body reactions that are essential for life. For example, water flushes toxins out of the vital organs, transports nutrients to your body cells, and provides a moist environment for ear, nose, and throat tissues, preventing damage owing to friction. Dehydration is a condition that occurs when we do not have enough water in our body to carry out normal functions. Even mild dehydration can drain your energy and make you fatigued. We must constantly prioritize water consumption because water is always lost through daily functions such as through breathing, sweating, urinating, or during bowel movements. Depending on a person’s activity, each person will require different quantities of water. 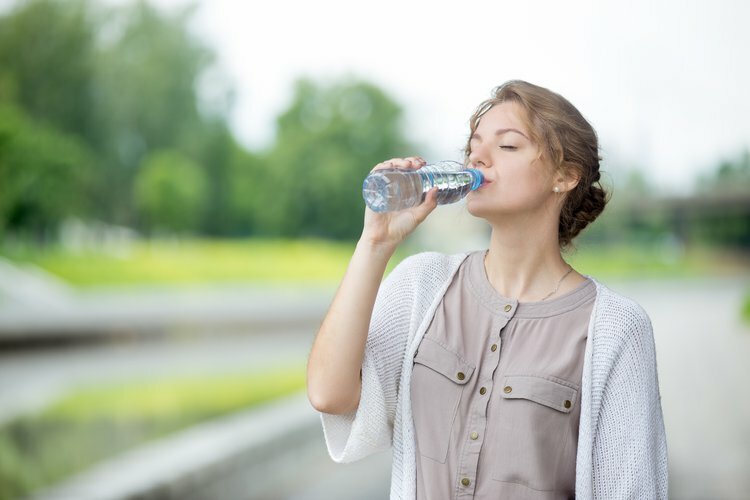 If you are athletic and exercise often, or if you are in a warm-moist climate, you will need to drink more water than someone who lives a sedentary lifestyle, or lives in a much cooler environment. The Institute of Medicine has determined that an adequate intake for men is approximately 13 cups (3 liters) of total beverages a day. The adequate intake for women is about 9 cups (2.2 liters) of total beverages a day. Adequate consumption of water can help control the calories consumed. If you are trying to lose weight or maintain a certain weight, drinking lots of water can help you cut down how much you eat. Even though water contains no calories, water consumption helps energize your muscles. Your muscles do not work well when there is a disturbance in the balance of fluids and electrolytes. The American College of Sports Medicine recommends that people drink approximately 17 ounces of fluid, about two hours before exercise. During physical activity, people are to drink water regularly to stay hydrated and to replenish the body from lost fluids. Your body converts the food material into useful products and creates waste products that could potentially be harmful to the body. In order to flush these waste products and chemicals out, your kidneys need water to filter waste from the blood and excrete it through urine. Drinking a lot of water may also help prevent urinary tract infections and kidney stones. If you are severely dehydrated, it may lead to kidney failure. Adequate water consumption can maintain hydration and make your skin more supple and face more vibrant. When an individual is dehydrated, their skin becomes less elastic and loses vitality. Also, drinking water will help your body work with the sunscreen you have applied, by protecting the skin from sun damage. We can receive adequate fluid in the body by eating more fruits and vegetables too, along with drinking water and other beverages. Normally, about 20% of our fluid intake comes from the foods we eat. Sawka, M. N., Burke, L. M., Eichner, E. R., Maughan, R. J., Montain, S. J., & Stachenfeld, N. S. (2007). American College of Sports Medicine position stand. Exercise and fluid replacement. Medicine and science in sports and exercise,39(2), 377-390. Ritz, P., & Berrut, G. (2005). The importance of good hydration for day-to-day health. Nutrition reviews, 63(suppl 1), S6-S13. Rio, M. I., Shand, B., Bonati, P., Palma, A., Maldonado, A., Taboada, P., & Nervi, F. (2012). Hydration and nutrition at the end of life: a systematic review of emotional impact, perceptions, and decision‐making among patients, family, and health care staff. Psycho‐Oncology, 21(9), 913-921. Kolasa, K. M., Lackey, C. J., & Grandjean, A. C. (2009). Hydration and health promotion. Nutrition Today, 44(5), 190-201. Campbell, S. M. (2007). Hydration needs throughout the lifespan. Journal of the American College of Nutrition, 26(sup5), 585S-587S. Buyckx, M. E. (2007). Hydration and health promotion: a brief introduction.Journal of the American College of Nutrition, 26(sup5), 533S-534S.